I often read short stories alongside a novel, something concise and manageable to serve as a change of pace from my main read. The stories in Stay Up With Me fulfil this role perfectly: several are poignant and melancholy; one or two are painfully amusing; all are very enjoyable indeed. This collection consists of thirteen stories, some of which have already appeared in literary journals and publications (including McSweeney’s and the Chicago Tribune). As with other collections I’ve reviewed, I’m not going to try to cover each story in turn. My aim instead is to give a flavour of the themes and a little of what I thought of the set as a whole. Barbash’s stories concern themselves with the troubled lives of middle-class Americans, mostly individuals living in New York City or Upstate NY. Several of the stories delve into the relationship between a parent and their child – some are told from the perspective of the parent while others focus on the child’s viewpoint. In many cases, the mother or father is no longer with their original partner – these tales feature the separated, divorced and widowed. In the opening story of the collection, The Break, a mother watches as her son takes up with a woman she considers to be beneath him, a low-ranking restaurant hostess. The mother is struggling to come to terms with her feelings towards this woman; she is upset and angry. The mother’s own marriage ended in a separation, so she wants something better for her son – she’s aiming for perfection. The hostess, however, is far from ideal; it’s as if this woman has violated the mother’s hopes and dreams. When I think of this collection, one of the main themes that come to mind is a sense of emotional distance. Many of these stories involve people in a state of emotional disconnection, individuals struggling to connect with a member of their family or with life in general. In Her Words, one of my favourites from the collection, a college lecturer feels compromised when his son, Rajiv, starts dating one of his pupils, an attractive girl by the name of Rachel. Before long, Rachel is sleeping over at the lecturer’s house, padding around with her underwear exposed and observing the father as he reads in bed. The father is uncomfortable with the lack of privacy in his own home, but when he expresses his concerns to Rajiv, the boy is unresponsive. “It’s my house too,” he replies. As the story unravels, it’s as if the traditional roles of parent and child have started to reverse. The son is the one setting the ground rules; the father must reluctantly accept the new order. It is at times like this that I wonder if it is possible to dislike your offspring, whether the rule about love holds for every father and son. Because I do not like his selfishness when it comes to me. In Balloon Night, another favourite from the collection, Timkin is hosting a Balloon Night Party is his city apartment, an annual event where guests can view the balloons being inflated for the Macy’s Thanksgiving Day Parade. As the story begins, we learn that Timkin’s wife, Amy, has just walked out leaving him with little time to call the guests and cancel the party. Undeterred, he decides to go ahead with the event and pretends his wife is away on business. There’s a bittersweet contrast between the buzz of the party and the fading nature of Timkin’s marriage to Amy. It feels like one of Barbash’s signature stories. Russell is a bit of a dork. Even though January opens on a humorous note, the story soon turns much sadder and darker in tone, but these emotional changes never feel awkward or forced. Eric (Lonesome Reader) has also reviewed this collection. 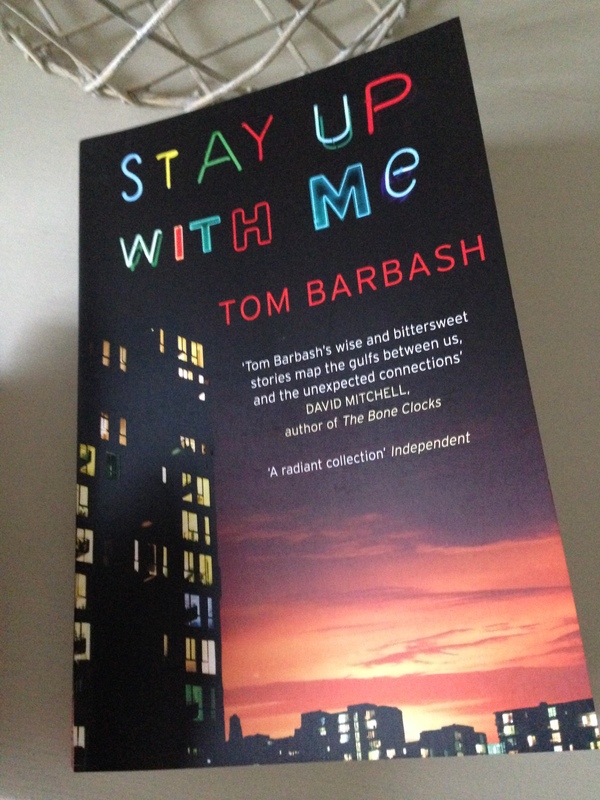 Stay Up With Me is published in the UK by Simon & Schuster. Source: review copy kindly provided by the publisher. This entry was posted in Barbash Tom, Book Reviews and tagged Book Review, Fiction, Short Stories, Simon & Schuster, Tom Barbash, US on June 22, 2015 by JacquiWine.